Set in the beautiful village of Granchester, our picture perfect, thatch roofed pub is a 2 minute walk from The Granchester Meadows and a lovely 20 minute stroll along The Cam from Cambridge. Join us on warmer days out in our beautiful garden, weekends sees the BBQ fired up along with our take on a mini bar, with quirky drinks to quench your thirst. A play tower and table tennis for energetic people and deck chairs if you need a snooze. Perfect for Christmas or Birthdays, you can now purchase a gift card to be used at The Red Lion. Buy a round for a later date or pay for your party tab by purchasing a gift card now. Muddy boots and dogs are both welcome so bring the mutt and settle in next to the fire. 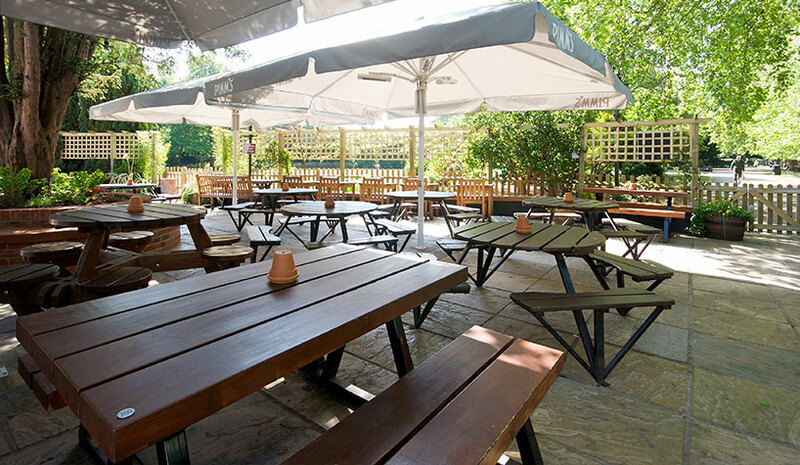 On sunny days grab a deck chair in our lovely garden where we have a BBQ shack, and table service on the terrace. Families are always welcome too as kids can enjoy our play park at the back of the garden.